Choosing storage for just one small room is challenging enough. But what if your whole house is on the small side, and every space, from kitchen to bathroom to living room, lacks storage? With our comprehensive guide to small house storage, you needn’t worry about lack of space. 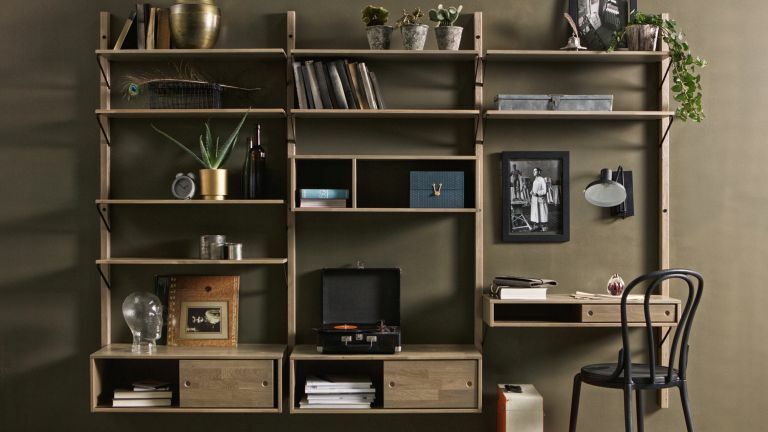 From tried and tested options such as storage boxes and shelves to more innovative and unexpected small room storage ideas, we have picked the best storage solutions for every room in your (small) house. Hallway storage is often neglected. Hallways are usually narrow, so tricky to furnish, but with clever storage furniture and shelving units, even a small hallway can fit a lot of stuff. Storage benches are our favourite type of storage for hallways – not only are they practical for stashing everything from shoes and bags to coats and the dog's lead, but they also up the comfort factor by providing seating (perfect for putting on those shoes). We like the handsome and sturdy Willow Large Buttoned Blanket Box from Cotswold Co.
A substantial shelf unit can make a huge difference to the storage capacity of a hallway. Pick one that has lots of adjustable shelves in different sizes; you’ll be able to finally tidy up all of your shoes and fit in a few storage baskets, too. Our pick is the impressively roomy Pembroke Fitted Storage Unit from Neptune. It is an interesting alternative to more traditional hallway shoe storage and is especially useful if you wear lots of different pairs in rotation. Even small homes have decent space for under stair storage. Make the most of yours by having the space beneath your stairs fitted with proper storage cupboards, shelves and/or drawers. This bespoke under stair storage closet is by De Rosee Sa Architects. Thought your living room couldn't cope with a roomy sofa? What about if that sofa incorporated not just a sofa bed but a living room storage compartment, too? The comfy Tidsworth Chaise Storage Sofa from Willow and Hall not only doubles up as a bed (handy if you don’t have a guest bedroom), but it also has a dedicated storage space for bedlinen – or anything you want out of sight. If you only have room for one storage unit in your living room, why not choose a multi-tasking one? Think something slim that can double up as storage for the TV plus a small study area, too. We like the Gyan Bespoke Wall Storage Unit from Cuckooland. Like to keep your storage subtle and your room tidy? From the front, this is just your average wooden headboard, but if look to the sides, there's hidden storage. The Brimnes headboard has three shelves that are adjustable so you can move them around depending on what you want to store. Find more clever headboard storage ideas in our dedicated feature. If you need substantial small bedroom storage that's won't look like it's taking up lots of floor space (even if it is), a wardrobe with sliding mirrored doors will not only provide proper clothes storage, but also visually enhance your small bedroom, plus you don't need to factor in floor space for when the doors are opened. We like the sleek Pax wardrobe from Ikea. If you have limited space in a child’s bedroom, and especially if your child is likely to be staying in the same room as they grow older, choose kids' room storage that is functional and can easily be rearranged or dismantled. A wall mounted storage unit will keep all small items tidy and can be removed or reconfigured. Our pick is the slick and unobtrusive Kids Wardrobe Storage Solution from Elfa. Its minimalist design with adjustable shelves and drawers will suit children of all ages, right up to their teenage years. Exploiting under bed space for storage is a no-brainer in a kid's room, so why not super-size yours by going for a raised bed with plenty of storage space beneath? The floor space used is the same, but the storage gain is maximised. We like the Mid Sleeper with drawers, bookcase and storage bookcase from Little Folks Furniture. Love the paint effect? Don't miss our feature on colour block paint effects. Choosing kitchen storage is all about freeing up precious counter space, so make the most of wall space with shelves, cabinets – or even better, a combination of the two. We would all love a large kitchen like this with an island in the middle, but if you can’t have that, opt for half-depth cupboards and shelving like this unit that will fit all your crockery and make a nice display, too. The beautiful Suffolk kitchen range from Neptune comes in a wide range of customisable options. When choosing wall-mounted shelves, go for ones that come with handy hooks for cups. A large selection of shelves with hooks is available at Wayfair. Small bathrooms storage has to look good so that the result is a streamlined space. Choose a combination of storage solutions for a laid back look: tallboys, under-the-sink cabinets, and drawer units work best. Want more? We've got storage for standard-sized bathrooms, too. We like the way the shabby chic Maize 4 Drawer Cabinet is combined with the Vida Liano Freestanding Tall Bathroom Cabinet in this bathroom from Wayfair. Starting from scratch? A bathroom cavity wall can create a pocket into which you can sink a storage cabinet. Better still, if the cabinet has a mirrored front, its bulk will be further reduced and disguised. This compact Jarrow Wall Cabinet from Neptune contains customisable shelves, but it also has a mirrored front. More clever ideas like this in our small bathroom storage feature. Garden storage in a small space, such as a balcony or terrace, can be tricky; with limited room available, the last thing you want to be looking at is bulky storage furniture. But you can make more space for plants and have a neat outdoor area by putting tools and even bags of compost into a storage bench. The Applaro Storage Bench from Ikea has ample room for storing everything from tools to blankets, and is perfect for creating an extra garden seating area, too. In a small garden or even on a balcony, peg boards are handy storage solutions. Love this? Find more in our shed storage ideas feature. The Hang it Peg Board from designist. comes with eight hooks and one shelf. Hook yours on a wall, to the side of shelving or the back of a door.